Edmond, Oklahoma is a beautiful community offering residents safe suburban living with the added benefit of plenty of amenities and services found in larger cities. This rapidly growing little city, located only about 14 miles from Oklahoma City, focuses on providing peaceful surroundings with strong family values. Its proximity to Interstate 35 and Interstate 44 makes for a short commute to downtown Oklahoma City. 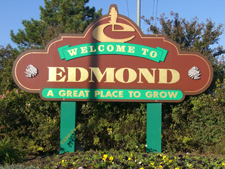 With a population of approximately 36,000, Edmond has retained its small town environment and charm, which explains why many people have chosen to purchase Edmond OK homes and settle down in this unique environment. The historic downtown shopping area boasts a wide variety of one-of-a-kind shops and boutiques that appeal to shoppers. Those looking for more recreational activities can find them at Arcadia Lake, while many festivals and events lure visitors to Edmond year round. Those considering purchasing Edmond homes will find many different models and designs from which to choose in this close-knit community of friendly people and numerous attractions. Quality education at all levels from elementary to college encourages buyers to seek Edmond homes for sale in record numbers. The Edmond Ok Real Estate market is thriving as prospective Edmond Home Buyers find their dream homes in this quaint community that offers a school district committed to providing the best possible education for all students. Educators challenge students as they prepare them for a lifetime of learning. With three unique universities offering distinctly different degree programs, those pursuing higher education. Family residential homes, foreclosures, condominiums and multi-family units constitute some of the available Real Estate in Edmond. The city offers many choices for prospective homeowners or investors. Prospective homebuyers considering purchasing one of the homes for sale in Edmond should take advantage of the experience and expertise of professionals in the Edmond area. The Weber Home Team works tirelessly to help each prospective buyer find the right property at the right price. Their professional advice and hard work help make the daunting task of buying a new home less stressful and more rewarding. Dan and Janet Weber are Edmond Real Estate Agents who provide clients with professional services unequaled in the area. These Edmond Real Estate specialists help prospective buyers reach their goals by assisting them through every phase of the transactions. The Weber Home Team with Keller Williams Realty takes pride in being a trusted Edmond Realtor® dedicated to providing top service for the Edmond Home Buyer. 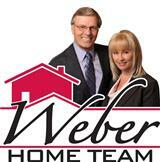 Contact The Weber Home Team today for assistance with Edmond, OK real estate.